A turbidity meter is located on the return line of a CIP cleaning loop prior to the return drain valve. 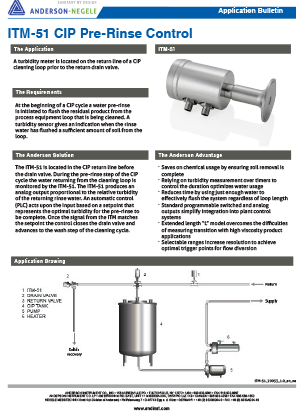 At the beginning of a CIP cycle a water pre-rinse is initiated to flush the residual product from the process equipment loop that is being cleaned. A turbidity sensor gives an indication when the rinse water has flushed a sufficient amount of soil from the loop. The ITM-51 is located in the CIP return line before the drain valve. During the pre-rinse step of the CIP cycle the water returning from the cleaning loop is monitored by the ITM-51. The ITM-51 produces an analog output proportional to the relative turbidity of the returning rinse water. An automatic control (PLC) acts upon the input based on a setpoint that represents the optimal turbidity for the pre-rinse to be complete. 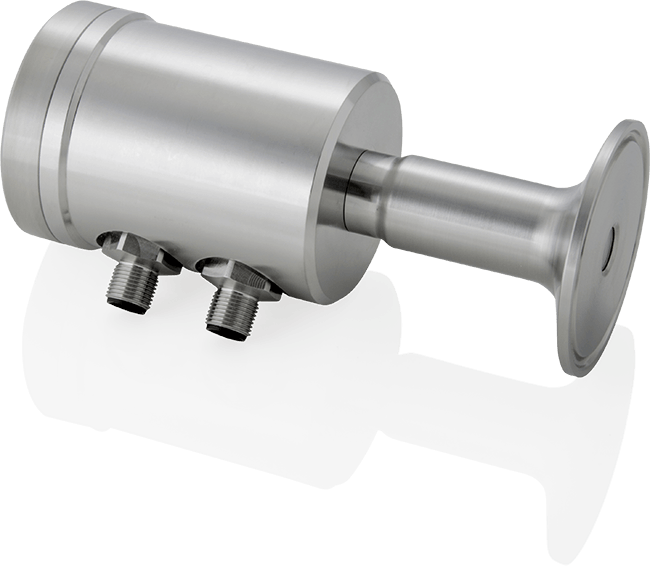 Once the signal from the ITM matches the setpoint the control closes the drain valve and advances to the wash step of the cleaning cycle.